How to cope with the increasing burden of education costs? Cost of living is a big consideration in expat packages and for anyone planning to move abroad. For parents who are relocating their families to take on an assignment abroad, the cost of international schooling in the new city can be a major burden if not properly assessed early on, or adequately subsidised by the employer. In light of this, we zoomed in on education and conducted our first ExpatFinder International School Fee Survey 2016, which gathered responses from 707 international schools across 98 countries. The report triggers food for thought on what financial challenges expats might be facing when considering the education of their loved ones, and what are the solutions both the employers and families are coming up with. As the cost of education around the world escalates, the true cost of educating your children abroad for the full duration of the assignment or as you settle down for the long term is difficult to apprehend and often underestimated. Price inflation and incidental expenses are some of the unexpected costs that can come into the picture. This mapping of international school cost is here to help you assess what you should be asking for if your company is offering you an assignment, or simply manage your expectations on “a better life” abroad. “We still see a trend of expat families looking for growth opportunities offshore given challenges in the domestic environment. However, according to our survey findings, international school fees are steadily rising, particularly in markets that are popular destinations with expats,” said Sébastien Deschamps, CEO and Founder of ExpatFinder.com. “The rising cost of international education, coupled with an ongoing trend of employers replacing traditional expat packages with local contracts, increases the financial burden on expats considerably. While employers must be mindful of the financial pressure that relocating a family and moving children to international schools can place on expats, globally mobile employees must also take into account those education costs and taxes as early as possible in their salary negotiations. This is particularly true when the employer uses the host country local salary as a benchmark without including additional benefits such as an allowance for international school fees and boarding,” explained Mr Deschamps. China, Hong Kong, Singapore have the costliest international schools in Asia while Switzerland, Belgium and the United Kingdom dominate Europe. Based on the median of the 6th grade tuition fees per country, China (US$36,400 per annum), Switzerland (US$28,300 per annum) and Belgium (US$27,800 per annum) come out tops as the most expensive countries for international education. “We shifted both our children to an international school so they can learn French, our mother tongue. However, the high cost of education has in turn, changed the way we budget for our lifestyle. We now limit ourselves on spending much more than we did in our home country. Paying for education and extracurricular activities now takes up the largest part of our monthly budget,” said Helene Denaiffe, a French expat residing in Singapore. 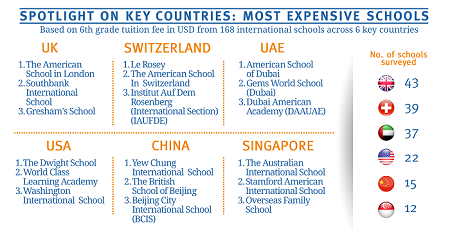 Among the 707 international schools surveyed, the tuition fee goes as high as US$48,170 in Switzerland’s Institut Le Rosey, and as low as US$860 in Colombia’s Colegio Anglo-Colombiano. The schools at the top of the list of some key countries are as follow. “Over the past few years, given price inflation, education costs have become more noticeable as a line-item in the total assignment cost. We encourage our Destination Provider to help parents identify schools that is best suited to the child, as factors may depend on the child’s personality, learning styles and cultural sensitivities. Often, we find parents of younger children favour smaller and more intimate schools that are not necessarily the most expensive, but it depends on the child and how best to cater for their education needs. Given the rising costs of education and ability to access top schools in certain locations, we are noticing an increasing trend of short-term international assignments and commuting assignments where children remain in the home location,” shared Stephen Park, Head of Global Mobility at Fonterra. Boarding option is popular among parents with children who live far away from their international school. So, we looked at the fees at the 11th grade, where boarding is typically offered. A total of 53 international schools across 24 countries were sampled, and we found drastic changes in the results. 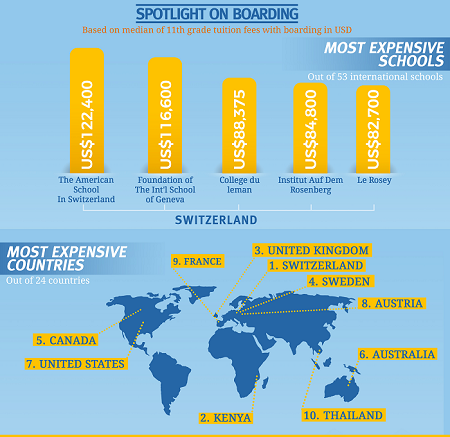 Notably, the top five most expensive international schools are all found to be in the top country, Switzerland. Their fees range from US$82,700 to US$122,400. For long-term assignments, you may want to take note that the tuition fees are likely to increase over the years. Our report highlight the fees in 2016 have jumped by 3.43%, as compared to the previous year. It is important you ask the schools you are applying to what will be the rate rise in the next coming years. Some parents have been caught up in the past by debentures almost doubling. It is also not accurate to estimate the school fees based on one or two schools handpicked in a country. 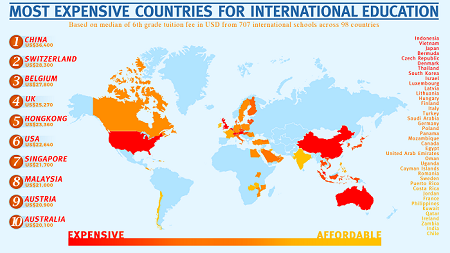 Sometimes, the prices between schools in a country is a world of difference and we highlight here the countries with the highest price variance. “All our policies consider education assistance for assignees and foreign nationals hired on local terms and the critical factor is whether their children have access to local schools without compromising the quality of education available in the right language and suitable curriculum. For example, we do not provide international school support for children between comparable locations such as Australia, USA and New Zealand. How we deliver education assistance can be country specific, depending on local requirements and employment tax planning opportunities, and we look at the following methods – direct payment by the Company via accounts payable, expense reimbursement or cash allowance. Our preference is cash allowance as it brings us better control, but it is location specific. In countries where there is price variance with certain school fees being relatively high, we cap the cash allowance,” added Mr Park. 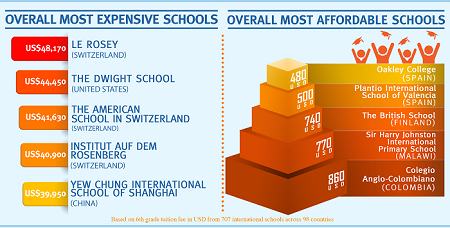 In general, American schools’ 6th grade tuition fees rank most expensive and costs an average of US$17,095 per annum. This is followed closely by British, Canadian, French and German schools. Spanish schools have emerged as the most affordable, standing at only US$6,320 per annum. In a capital or secondary city? In conducting your research to see which school will fit the best, it is wise to choose a location within a reasonable distance from your home. Our survey shows that price varies greatly whether you will be posted in the capital city or in a secondary city. “I'm surprised to see such a price gap between international schools in Paris and in other French cities. International school fees in Paris are indeed quite expensive for families not supported by their companies or embassies. However, as an expat child myself, I would recommend to avoid changes in schooling systems and focus on what is best for the student’s learning,” commented Camelia Pierre, expat mother of two from France. Are all these costs accounted for? There are typically three types of mandatory costs listed in international school enrolment: admission, registration and application fees. However, these are not representative of the average expat parent’s international education expenses. Other incidental costs include meals, uniforms, material or books, transport, examinations, extracurricular activities, elective subjects and boarding. “The cost of international schooling continues to be a major challenge for both expatriates and HR departments trying to create competitive yet cost-effective benefits programs. Expats are often faced with no choice but to pay expensive schooling fees as it becomes increasingly more difficult or impractical in many countries to enroll foreign children into the local education system. With the move towards more localised assignment terms, HR needs to develop creative and flexible packages that assist with this additional financial burden (typically not factored into local competitive pay scales). By removing this barrier and creating a consistent and fair policy, organisations can continue to attract and ensure the mobility of their top talent,” advised Sean Collins, Managing Partner at Talent Mobility Search. All in all, it is both the interest of the employees and their hiring companies to see that the international education expenses remain manageable. High education cost can be detrimental to an overseas assignment as much as other factors such as changes in immigration laws and spousal unemployment. The ExpatFinder International School Fee Survey 2016 is part of our efforts to help expats navigate cost challenges surrounding global relocation and highlight opportunities for companies to remain attractive to foreign talents. You may download it at this link.